Tucked away in a sunny Dallas bookstore is a group of teenagers with much to say. These young people are eager participants in an open mic event hosted by Dallas Youth Poets, an organization that seeks to empower young poets to write poems that might change themselves, their communities, or the world entire. 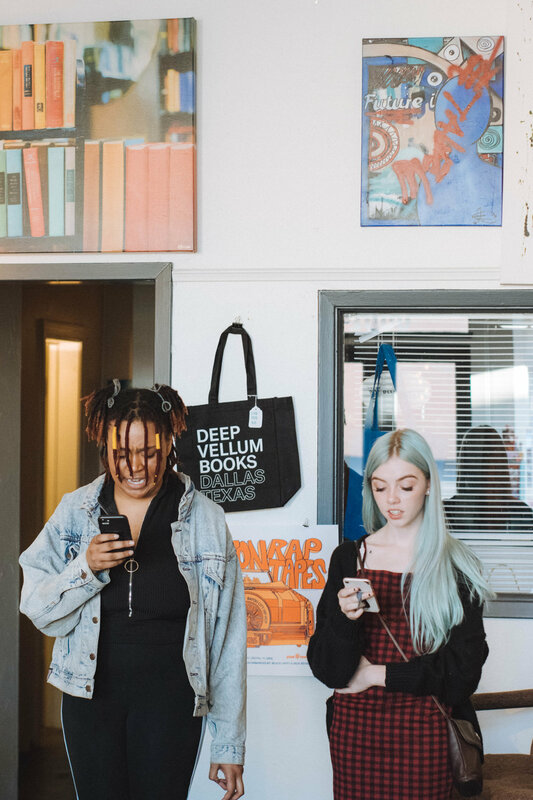 Like teenagers across the world, the students of Dallas Youth Poets grapple with weighty emotions such as anger, anxiety, fear, and even forms of depression. “Everyone was making me so mad and I had so many different emotions,” explains Kyhvae as she speaks of her journey to Dallas Youth Poets. “I just wanted to get it off my chest in a way that was coherent.” Khyvae, like so many other young people, is wondering: How will I be heard? Does my voice matter? “Rage” Tench spearheads Dallas Youth Poets with the help of two counterparts, Princess McDowell and Terry Odis. Identifying under the pseudonym of “Rage Almighty,” Rage hails from Boston as a full-time poet, winning Poetry Slam competitions and working as a teaching artist. Rage is a two-time Dallas Poetry Slam champion and represented the U.S. in the World Cup Poetry Slam in Paris. 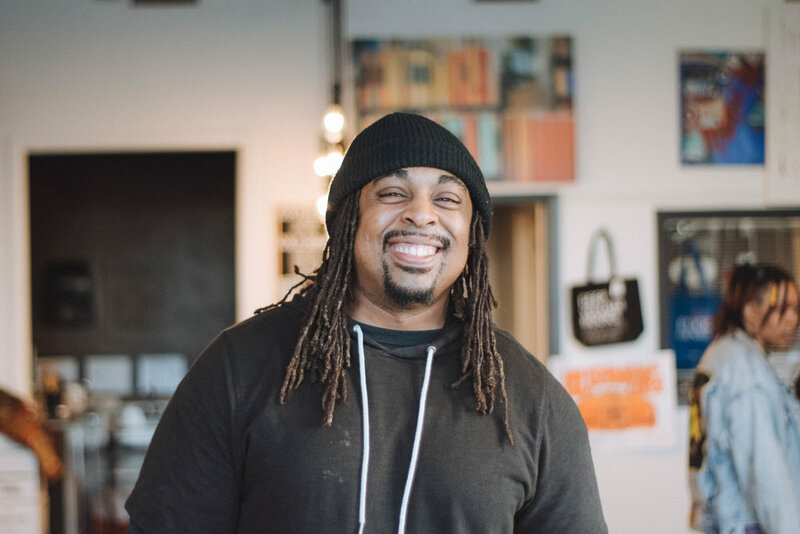 He is modest about his achievements, but is the recipient of awards such as “Teaching Artist of the Year” by 2016 Louder Than a Bomb poetry organization and “Poet of the Year” by the 2014 North Texas Spoken Word Award. He has also walked in the shoes of today’s Dallas Youth Poets. In his early days of writing poetry, he was often the youngest person at adult poetry slams and open mics, hoping to share his words with a crowd of more experienced adults. “I remember what I went through when I was younger and the things I struggled with,” Rage observes. “These kids have a lot of opportunities in art and poetry, more than I had.” By day he works as a teaching artist in various schools, after-school programs, and detention centers; where his classes involve poetry, writing, acting, and rapping. Workshops, open mic events, and slam poetry competitions are the main components of Dallas Youth Poets. A student begins by attending workshops, where they may fine-tune their writing skills, engage with a mentor, and practice putting their words on paper. When young poets are faithfully attending workshops and sharing their work at open mics, they are invited to compete for the slam poetry team. A slam poetry competition consists of poets reading their poetry aloud without costumes, music, or other accompaniment. The goal is to win the favor of the judges, who can be ordinary non-poets, which allows everyone in the audience to engage in the creative practice. The Dallas Youth Poets slam poetry team consists of the top five or six students who are willing to work hard during their out-of-school hours to create a collection of fine-tuned poetry. Without a doubt, the students of Dallas Youth Poets are finding their voices. As Triniti shares, “[Poetry] was me gaining power over whatever I was feeling at the time.” Jillian, a veteran Dallas Youth Poets, shares that “the more true I get to my experiences and my perspectives, the more appreciated my work is.” Jillian runs a Youtube channel with nearly 15,000 followers tuning in to hear her poetry. She admits that she receives an influx of messages from listeners who now feel less alone, are inspired to share their stories, or have been brought out of a dark place because of her poetry. Dallas Youth Poets’ success is not only emotional, but it is tangible: last year, the slam poetry team made its way to top eight in the world! Their repertoire of slam poetry competitions includes the Green Chile Invitational in Albuquerque, New Mexico; Speak Up Speak Out in Bryan, Texas; and Brave New Voices in Las Vegas, Nevada. Individually, the students are also finding their own success in poetry. Je’da, a tenth grade poet, has been asked to share her poetry in front of several audiences. She cites her “momager” (mom-manager) as the woman in charge of her busy schedule. The final, most critical component of Dallas Youth Poets is the method of passing the baton to the next generation of poets: mentoring. Just like Rage and his fellow leaders mentor the Dallas Youth Poets, so the older generation of poets is mentoring the younger generation. Jillian, now eighteen years old, casts a vision of becoming the person she needed when she was younger. She believes her teenage experience could have been improved by the presence of a stable role model. “I feel a sense of fulfillment because I’ve become what I needed back then for girls who are going through things that I went through,” she pronounces. Jillian’s success in poetry and her learned life experience make her a relevant, necessary mentor to other young women and poets. As an oft-overlooked facet of the youth creative industry, poetry is proving to be a powerful catalyst for emotional literacy. 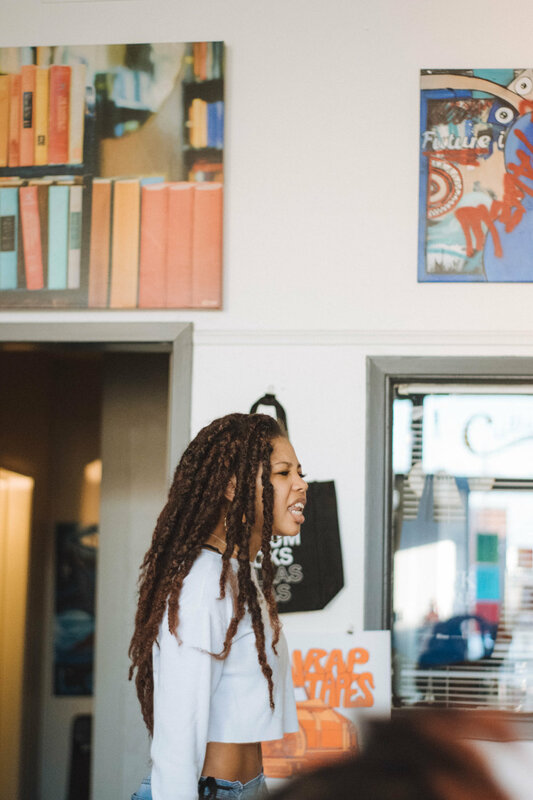 The mentorship and safe space offered by Dallas Youth Poets are equipping young people throughout the Dallas metroplex to find their voice. Dallas Youth Poets is fueled by volunteers and pizza, both of which are in high demand. Rage says with a smile that it takes boxes of pizza to feed hungry teenagers, and welcomes mentors and chaperones for workshops and events. Open mic events are also always welcoming of an audience - more information can be found on their Facebook page. Story and photos by Katie Kelton.